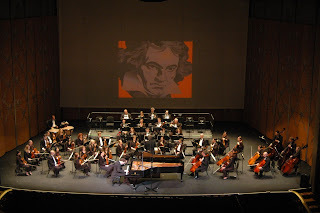 Seattle Chamber Music Festival, Seattle WA. An unusual experience occurred to me along with a few of my close friends preparing for the premiere of a new Clarinet, Cello and Piano Trio by composer Ronn Yedidia. 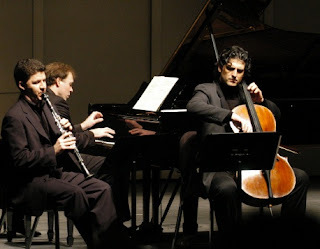 The other parts were played by Alex Fiterstein, Clarinet and Amit Peled, Cello. The piece was commissioned by the Seattle chamber music festival - one of my favourite summer festivals. The artistic director of the festival, Toby Saks had the brilliant idea to have an open dress-rehearsal the night before the premiere, open to the commissioning club members - about 30-40 people. Needless to say the piece was in its raw stages, new in our ear and fingers. Our plan (Alex, Amit, Ronn and me) was to play through the piece once, then do a few touch-ups, possibly answer some questions by the audience and time-permitting, play the piece again... altogether about an hour, then have the organized reception. As it turned out, having an audience raised the level of concentration, involvement and commitment and immediately following the first run-through we delved into the piece for an hour long intense rehearsal, a very thorough one. There was some kind of electricity in the intensity between Ronn, the three of us and the audience - high voltage. After working on the piece we decided to open the rehearsal for questions and answers with the audience - these ranged from questions on the writing for each instrument, the difficulties, the style, the inspirational sources etc. We were well into the third hour of this "dress-rehearsal", and then we all decided (with the audience) to have the second run-through. This second "performance" was on such a higher level then the first time we played, it was almost embarrassing. The growth that we had all experienced with the piece in the course of this single rehearsal was so overwhelming... it was frightening. We felt quite secure the first run-through, but after the process that we had all been just now, this second run-through opened the door and revealed so many hidden treasures. All throughout the reception afterwards the main topic discussed was the way we all grew together (musicians and audience) with the new commissioned piece, all in the course of one single (intense) dress rehearsal.